It’s been a big week at GDS, thanks to the release of the Government Digital Strategy, but that’s not the only thing the team has been up to. Here’s a quick round-up. Last Sunday the businesslink.gov.uk website came to its contractual end, which Helen Hardy from HMRC wrote a guest blog post about, and lots of work was done ahead of that to make sure all of the redirections were in a good shape. The team responsible for those have also been busy making sure we can do the same job for departmental websites as they make the transition to Inside Government over the coming months. That was followed on Tuesday with the release of the Government Digital Strategy, the Digital Efficiency Report and the Digital Landscape Research. A few of the team have written about their experiences producing it, but it’s been particularly good to see write-ups from developers and policy specialists, who worked together to make the strategy part of the web, not simply on the web. 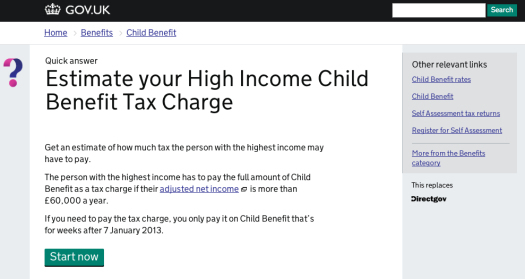 The GOV.UK team have been continuing support of the site following its release, and pushed out an updated version of the Child Benefit Tax Calculator this week. On Wednesday the Communications team met with central government departments to update them about analytics, Inside Government and how the reporting system is working. These workshops are a really good chance to find out things we need to improve on. We’re going to be paying a lot of attention to the feedback process for departments over the next few weeks as a result of those conversations. The Usability and Insight team had a lot of work ahead of Tuesday making sure the Digital Landscape Research was in a good shape. They’ve also been following up with teams throughout GDS to compile a list of what we need around User Research, to make sure we get the best out of our testing sessions. And, something that slipped off these notes a couple of weeks ago, we helped the Cabinet Office compile and publish a list of central government websites. On October 22nd there were about 350 out in the wild, down from 371, which is important to bear in mind as we help central government departments make the move over to GOV.UK. You'll hear much more about that next week. Is there a strategy to consolidate the number of websites into lot fewer.